Lysa & Huey Ink! : And So This Is Christmas. . . Truth be told it is not even Thanksgiving! Oh poor Tom Turkey just doesn't get a fair shake! I am in total Christmas mode already. Yet again all my fall linen and turkeys, crows and ceramic non - jack'd pumpkins won't see the light of day. Need I mention the lovely turkey salt and pepper shakers that once adorned my Thanksgiving table. It is sad I know. It seems I just go from Halloween black and orange right to the green and red. I think it is because my time is so limited with working and general life. I guess I have just come around to what works for me. 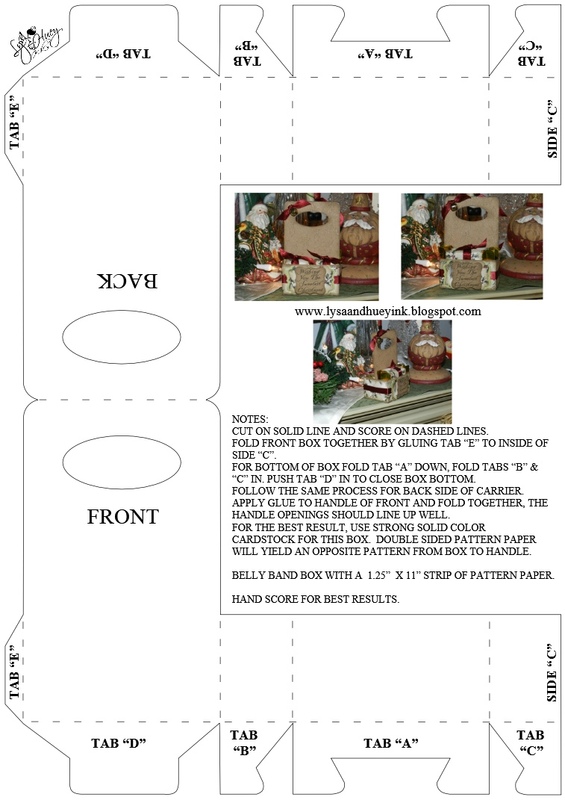 With that said, I wanted to post this file for my double sided carrier tote. Now please know that this tote was once 2 Stampin 'Up boxes that were glued back to back. But being digi minded I knew there was a better way. I had made this box for a wedding project in white embossed paper. It held 6 small bottles of bubbles (3 on each side). It was just beautiful. The carrier was on each table so that there were bubbles all night long through the reception. This little box can hold a lot. Here it is holding 9 pieces of candy (6 nuggets & 3 Ghirardelli chocolates). That's a whole lot of candy! I hope you will try to make this carrier, I think it would make a great snowman soup holder. If you need it to be smaller you can reduce the size as long as you maintain the aspect ratio. If you need any tips on assembly just give me a shout out and I will do my best to explain. I want to send out my best wishes to all for a Happy Thanksgiving and many blessing to you all for a joyous and safe holiday. I know how busy I get over the next 2 months so posting may be spotty but I will check in to answer any questions you may have. Lysa, thank you for sharing your files. You are very generous! it's appreciated. By the way, your display is very pretty! My pleasure to share. Now that I put the house in order(somewhat!) I can focus on cooking. After Thursday I can really start my crafting! 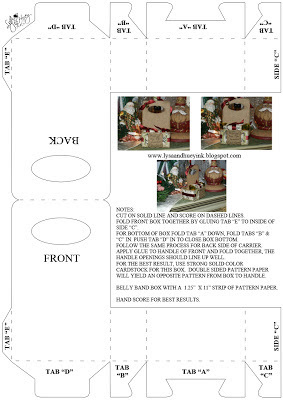 I hope you have use for the carrier tote, it comes in handy for larger project. Holds cookies and chocolate covered pretzels really well. Enjoy and have a Happy Thanksgiving! Another fabulous file Lysa :) I love your files, they cut beautifully. Thanks for sharing them with us.